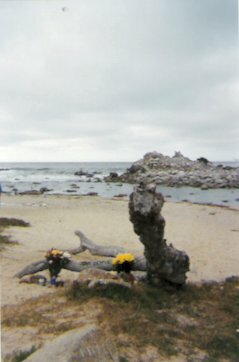 John died in the Ocean off Pacific Grove, California. Every year in October John Denver fans gather on the beach to remember him.They light candles around a piece of driftwood that bears his name and sing his songs. A piece of the John Denver Memorial Peace Cloth is laid across the beach. In October 2000 I was lucky enough to go the the memorial. 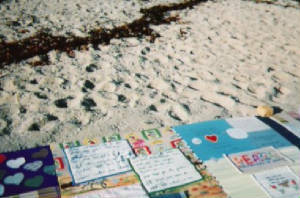 I was amazed when I found my piece of cloth in the peace cloth, especially as only a quarter of it was at Pacific Grove. Mine is the beige material with a flower pattern, top centre. It is a left over piece of material from the curtains I had in my bedroom as a child. When my mother died I found she has kept it all of these years! I wanted to send something that was very special to me and this seemed appropriate, especially as Mum was a JD fan too. 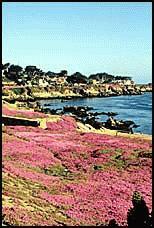 While I was in Pacific Grove, I was struck by the incredible beauty of the area. 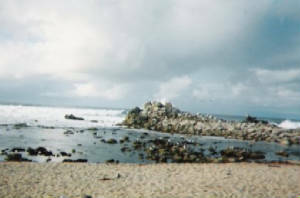 The ocean around the coastline of the Monterey peninsular is a national marine sanctury. I couldn't help but think what an appropriate place this was for John to die. In the midst of the Monterey Bay National Marine Sanctuary is the Monterey Bay Aquarium. 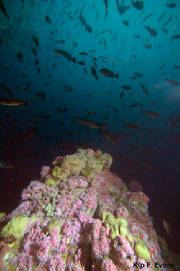 It is one of the modern wonders of the world and houses, among other things, a four storey kelp forest. A lot of important research into marine environments, particularly those of the deep ocean, is done here. I chose the name of this site from the way John always signed his name. John was passionate about peace, and I find it incredibly symbolic that he died in the Pacific Ocean - The Ocean of Peace. For me it was one of his most important messages.